New York Times op-ed writer heralded the Resistance Inside. Seems like it wasn’t the cavalry to the rescue, after all. As President Obama said himself at a speech in Illinois on Friday, these times are “not normal.” They’re “extraordinary,” and certainly represent a more “dangerous” time than ever for our democracy. We should understand that when the founders called for checks and balances, they did not mean adult supervision in the West Wing. But I had thought that along with the impending release of “Fear,” the Bob Woodward book where Trump is called by insiders “unfit” to be president and leading a White House described as “Crazytown,” the anonymous op-ed would lead to some kind of cleansing force–bipartisan momentum against Trump. In other words, we’d see people finally willing to put politics aside, and put our country and democracy first. The dream of high school civics! Reaching across the aisle as Americans was, after all, the bottom line of that op-ed. I even went into a Facebook chatroom the other day to engage with the Trumpiest Asian Americans—-who happen to be in the Filipino community. Given that the president is an unindicted co-conspirator, the subject of a criminal investigation, and exposed as chaotic and anti-democratic by Woodward and the anonymous writer, you’d think the Trumpy flips would want to flip. What I found is the Trumpys have drunk the Kool-Aid, and now they insist on taking it intravenously. Anonymous has fueled the base. And they ape whatever Trump is saying. “Gutless.” And now Trump wants the Justice Department to investigate—for what? The appropriate use of the First Amendment? Sadly, I’m coming around to the idea that maybe the Resistance Inside was just as phony as Trump. Mr. Anonymous seems to want it both ways–to be a Trumpy enabler a few feet away from power, as well as one of the adult caretakers of democracy held hostage by King Tantrum himself. Where’s the patriotism in any of that? It’s a hedge manager’s style. (Let’s see, any Goldman alums still lurking as senior officials?) Play both sides against the middle. You can’t lose. A real patriot would have come out and staged that 25th Amendment coup. That would have been history. Instead, we have an anonymous op-ed leading a “revolution” to nowhere. It surely hasn’t led to silent Republicans speaking out with Democrats declaring a bipartisan love of country. No, they’re still using Trump as their bullet-proof dummy to solidify their own power. That FB chat room I went into this week was a revelation. It wasn’t long before the exchange turned into the room’s members personally attacking me. So much for civil discourse in the age of Trump. All sides dig in, with no one persuasive enough to change a single mind. It’s a fight to the death, and since SCOTUS is the last word in any argument in the land that counts, it made the Senate Judiciary Committee hearings on Brett Kavanaugh this week even more important. If you watched any of the hearings, then you must realize they’re not the most effective way to vet a Supreme Court justice. What did we learn about Brett Kavanaugh in the hearings? His views on Roe v. Wade (abortion), on U.S. v. Nixon (executive power), on anything? Kavanaugh was even less forthright than Trump’s previous nominee, Neil Gorsuch. And yet in hundreds of thousands of documents, only a tenth of which was shared with the committee, there were a few things to be gleaned. For Asian Americans, among the items that stood out were the documents Sen. Mazie Hirono herself released, revealing Kavanaugh’s stance on Native Hawaiians. In documents marked “committee confidential,” maybe someone was trying to hide Kavanaugh’s racist views toward all people of color? It was an email reply Kavanaugh wrote in 2002, in which he was asked if Congress should treat Native Hawaiians as a Native American tribe. Other writings revealed Kavanaugh’s bias. I knew he was for a color-blind approach, but I didn’t know he was fact-blind too. He argued Native Hawaiians weren’t indigenous because they came from Polynesia. Of course, Hawaii is the northern tip of Polynesia. Kavanaugh claimed in the same 1999 op-ed for the Wall Street Journal, that Native Hawaiians didn’t have their own government or system of laws or elected leaders. “They don’t even live together (as in reservations) in Hawaii,” Kavanaugh wrote. But all of those assertions are historically inaccurate. And as Hirono pointed out, Native Hawaiians are entitled to the same rights and protections as other indigenous Americans in this country. Hirono asked him point blank: “Do you think Rice v. Cayetano raises constitutional questions when Congress passes laws to benefit Native Hawaiians? Kavanaugh gave a long answer capped with pablum. “I would want to hear the arguments on both sides. I would keep an open mind and appreciate your perspective on this question,” he said. It was a not-so-veiled message to constituents of Alaska Sen. Lisa Murkowski, one of the two Republicans who must cross over and join a united Democratic bloc if Kavanaugh’s nomination is to be stopped cold. Just another of the issues gleaned from the fraction of documents that were released to the committee only this week. Hundreds of thousands weren’t. And no delay was granted to find out what else Kavanaugh and his supporters were trying to hide. More broadly for Asian Americans, the issue of the Chinese Exclusion Act came up. Sen. Kamala Harris pointed out that the Supreme Court never struck down the 1882 law that specifically barred Chinese immigrants because of their race.. Kavanaugh was asked if the case was correctly decided, but he refused to comment. Watch it. Do you trust him? Maybe if the judge remained anonymous,, he could write an op-ed for the New York Times telling us how he’d really feel when wearing a black robe. Still there’s only so much we can glean from past writing. Lots of judges have appeared one way in confirmation, then done a 180 when it comes to critical issues. Justice Roberts on voting rights comes to mind. This time, if the 53-year old Kavanaugh gets the nod, we will have to live with the consequences for a very long time. Imagine if a Trump self-pardon or other abuse of executive power came before a divided SCOTUS with Kavanaugh sitting on the high court. 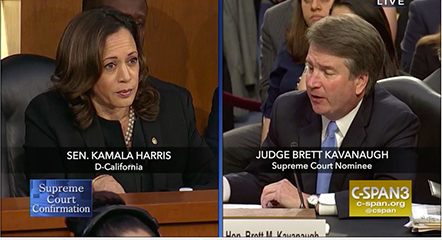 Kavanaugh wouldn’t answer when asked by Sen. Harris at the hearings. Our lesson: Don’t rely on the Inside Resistance to shake things up and reverse the trend. It will, however, begin in earnest if voters pressure the Senate to put country over politics and stop the confirmation of Brett Kavanaugh.